Whilst I was whiling away a lovely weekend in Copenhagen, my husband introduced my (somewhat picky) daughter to the wonderful world of beef jerky. Imagine my surprise when I went in for a big sloppy welcome-home kiss, only to find the delicious scent of mystery meat-stick upon her breath. 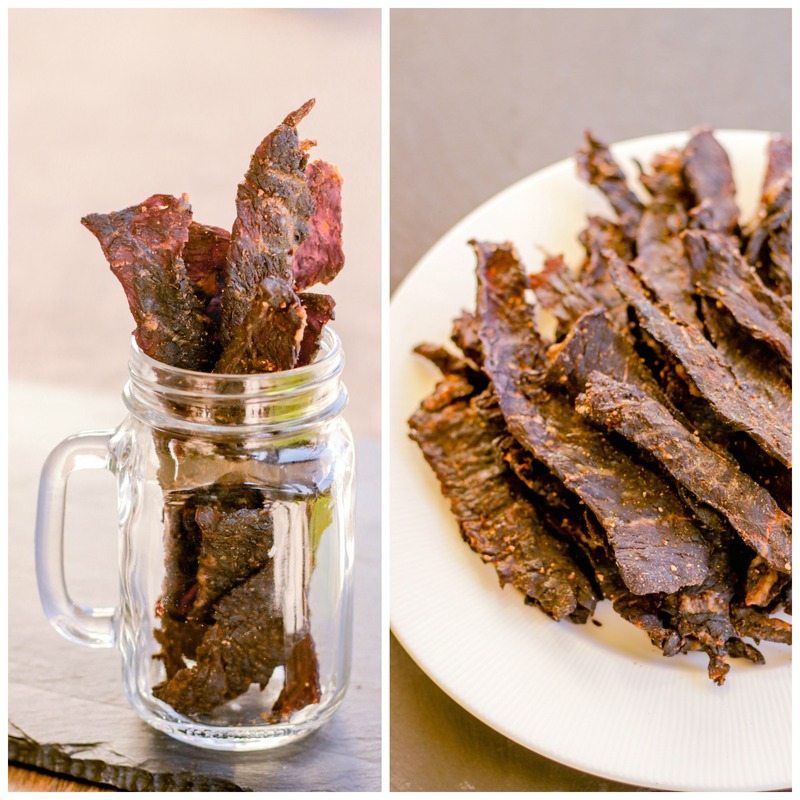 I decided it was in my best interest not to argue this point (hard to argue anything with your patient husband when you’ve been gallivanting about the world), and furthermore, beef jerky is protein, and protein is good, and my daughter needs more of it. But in my heart I knew I would feel better if she was eating a dried-meat of which I could both pronounce the ingredients and count them with my fingers. So I decided to make my own. 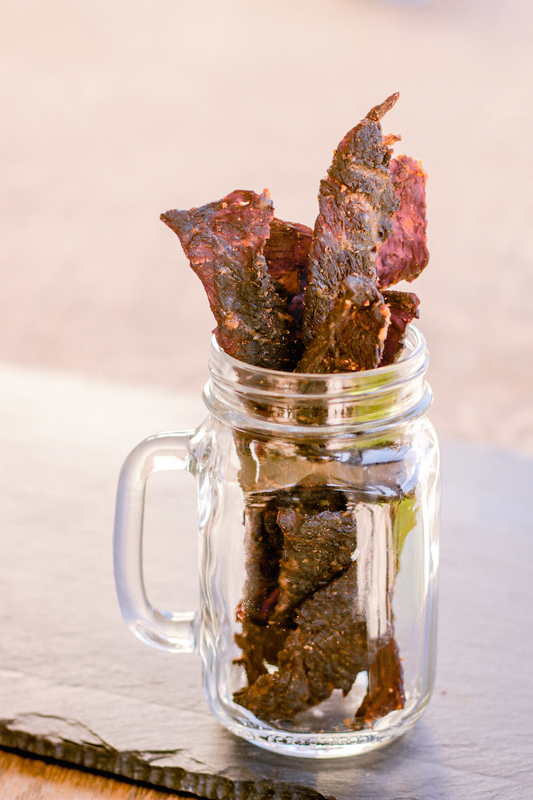 After experimenting a bit, I’ve come up with a recipe for beef jerky that my little one loves; not spicy, not too sweet, and without nitrates or any sort of mystery ingredients. When I say easy, I do not mean fast. This recipe takes some time, but it is not difficult at all, and even the novice cook can whip this up with some time and an oven. Start by placing the meat directly into the freezer for about an hour or two. This makes it easier to cut. Pound each strip with a meat mallet. Just go down each strip one time, don’t beat it so thin it falls apart. In a mixing bowl combine all other ingredients and mix well. 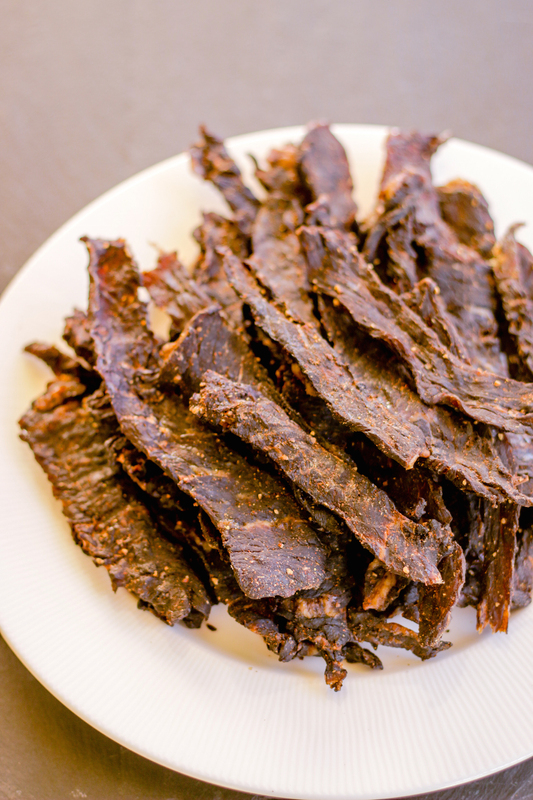 If you have a dehydrator, arrange the meat on trays without overlapping and let dehydrate, rotating trays every few hours, until completely dry, about 9 hours. If you have an oven, place meat on foil-lined baking sheets without overlapping, and place in oven on lowest setting (150-200). Turn strips every three hours until completely dried out, approximately 7 hours (could be 6, could be 9). Enjoy your protein-packed, completely un-mysterious meat!